As a perfect and the best WMV to AMV files converter, 4Easysoft WMV to AMV Converter provides the right and the easiest solution to convert WMV to AMV. In addition, this WMV to AMV Video Converter gives you a hand to convert WMV, ASF even HD WMV to MTV, MP3, MP2, WAV for your MP4 players, S1 MP3 players. 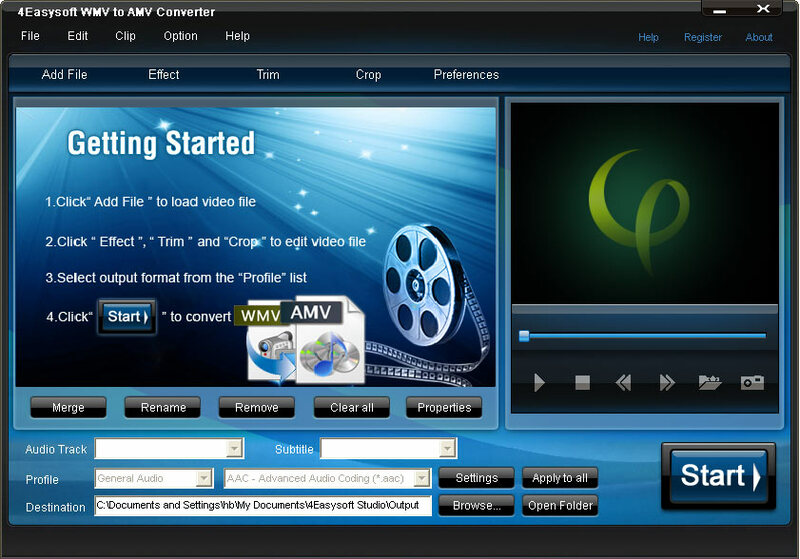 4Easysoft WMV to AMV Converter has a series of powerful editing functions, including merging files, trimming a clip, cropping video frame, adjusting video effect, adding watermarks to satisfy your different needs at customizing output files. 4Easysoft WMV to AMV Converter allows you to add WMV, ASF, HD WMV, MP3, MP2, WMA files and convert them to AMV, MTV videos and MP3, MP2, WAV audios with ease powerfully. Set several output formats from source file and convert in one go. Adjust the display brightness, contrast and saturation. Create special effects on videos by the way of putting a watermark in form of text or image. Note: You can set the font-size, font-family, color of text and change image position (from top to bottom or from left to right on the screen), transparence, etc. Clip several files, set time length according to your preference. Collect several video files and merge into one output file. The specific output setting parameters can be customized to correspond with your players, including video Encoder, Frame Rate, Bitrate, Resolution and audio Encoder, Sample Rate, Channels, Bitrate. Preview WMV video from the built-in player and take a snapshot of the film and save as a picture file.